Started in the back room of a small Dayton Ohio computer store, Cable to Go’s founders had a dream of delivering custom made cables at rock bottom prices. Back then, in 1984, all Cables to Go had was $3000 in startup capital, some technical know-how and a great deal of enthusiasm. After 25 years, the company’s popularity keeps growing and they’ve become a leading manufacturer and distributor of computer cables and connectivity solutions. Company products are available directly to consumers and reseller, and now, Restockit.com is proud to offer many fine products from this fine company. What Cables to Go does is focus on high-quality cable. Cables to Go focuses exclusively on computer and electronic connectivity products which creates a niche market us. 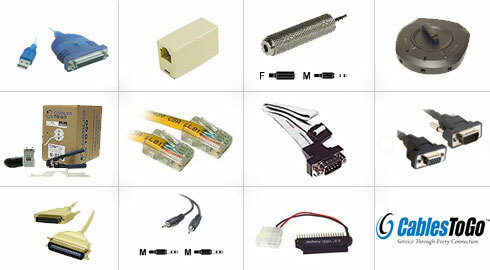 They specialize in computer and electronic connectivity products and use only the finest components and the latest construction technologies to optimize cable performance. They guarantee that each of their cables meets compliance to industry specification for each of its designated applications. When you work with electronics, you need cables. Today, nearly every home and business in America has multiple electronic devices. And that’s not counting the individual cell phones, PDAs, MP3 players and laptops that a lot of people carry with them wherever they go. Whether you need a chord for your MP3 player a charger for your phone, a cord for your television set or whatever the reason, Cables to Go can help you with our high quality, custom-built cables for almost any application. They also have tools and testers to decipher which of your old cords may not be working. Did you say USB and VGA cables? They have them for your every and all your needs. When you choose Cables to Go as your expert source for cable, you receive the highest quality connectivity products, a lifetime warranty on all cables, plus free technical support. With these unparalleled services, Cables to Go should be your only choice when thinking about solving your connectivity issues. Cables is what they do. Restockit.com is proud to partner with Cables to Go to bring you, the consumer, unprecedented value, quality and service from all our products. Restockit.com shares Cable to Go’s boundless optimism in promising you full satisfaction from our cable products and accessories - that’s a guarantee!